NASA’s space mission TESS is currently hunting for new exoplanets in the southern hemisphere sky. But while its primary aim is to find 50 small planets (with radii less than 4 Earth radii) with measurable mass, there is a lot of other interesting science to do. Today’s paper presents the discovery of a new exoplanet that is quite precisely characterised thanks to the complementary technique of asteroseismology used on the same data. TESS will survey stars over the entire sky, studying 26 strips for 27 days each. Data for selected bright stars is downloaded to give data points every 2 minutes (a 2 minute cadence) then processed through a pipeline to produce lightcurves. Another pipeline detects transit-like signals in these lightcurves and identified TOI-197.01 as a planet candidate (see Figure 1a). The authors used high resolution imaging by the NIRC2 camera on the Keck telescope to rule out companion stars that could produce a similar lightcurve. An intense spectral monitoring campaign of 111 spectra from 5 different instruments in a seven week period let them search for periodic Doppler shifts in the stellar spectrum caused by the mass of another object tugging on the star. The mass they calculated from these radial velocities (seen in Figure 3) confirmed that TOI-197.01 is an exoplanet. Photometry from space is not only useful for finding exoplanets: Kepler could detect the periodic changes in stellar brightness caused by stellar pulsations or ‘star quakes’. Asteroseismology, the study of these pulsations, allows astronomers to investigate the inner structure of bright stars and calculate their key properties, including radius and mean density, very precisely. Astronomers expected they could also study stellar pulsations using TESS data. After removing the transit signal from the TESS light curves (giving Figure 1b), the light curve is Fourier transformed from time (days) into frequency (microHz), giving the power spectrum seen in Figure 1c. Modelling the stellar pulsations along with the stellar granulation and white noise (see Figure 1c), the authors then ‘smoothed’ the power spectrum to identify the location of the tallest peak, i.e. the frequency of maximum power at 430 microHz, and its height, or power. Figure 1: The TESS lightcurve of TOI-197. a) Raw TESS lightcurve showing two transits marked by grey triangles. b) Corrected TESS lightcurve with transits and instrumental effects removed. c) Power spectrum of the corrected lightcurve, where dashed red lines show the granulation and white noise. The solid red line is a fit to these as well as the stellar pulsations. Figure 1 from today’s paper. The authors converted the ‘maximum’ power into amplitude and plotted this against the frequency of maximum power. By comparison against 1500 stars from the Kepler mission they confirmed it had solar-like oscillations. Another important value is the large frequency separation, found by identifying the difference in frequency between the radial mode peaks. These are marked blue in Figure 2 and have a value of 29.84 microHz. Figure 2: a) Power spectrum of TOI-197.01 in the region of frequency space showing oscillations. Vertical lines mark identified individual frequencies, with blue showing the radial modes. b) Blue circles represent the radial modes which line up vertically when the difference between them is 28.94 microHz, illustrating the large frequency separation. Figure repeats in the x axis about 0. Figure 2 from today’s paper. The authors then used stellar evolution and oscillation codes to model the stellar properties. The luminosities for the model were calculated by combining the Gaia parallax with photometry from many different catalogues. They also input properties they modelled from the spectra – temperature, surface gravity (log g) and metallicity – and combined them with the individual frequencies and large frequency separation from asteroseismology. This resulted in two preferred models: i) a lower mass, older star (1.15 Msol, ~6Gyr) or ii) a higher mass, younger star (1.3Msol, ~ 4yr). An independent constraint on surface gravity from an autocorrelation analysis of the lightcurve favours a higher mass model. Thanks to asteroseismology, the final estimates of stellar parameters have small uncertainties: radius (2%), mass (6%), mean density (1%) and age (22%). Figure 3: Data for TOI-197 folded on the best period of 14.3 days. Top: the TESS lightcurve. Bottom: radial velocity curve. Figure 5 from today’s paper. Using the mean stellar density from asteroseismology, the authors jointly fit the photometric and radial velocity data to obtain the planet properties, including period, radius and mass. Figure 3 shows both sets of data folded on the best period of 14.3 days. The mass ratio is calculated from the maximum amplitude of the radial velocity data. Combining this with the modelled stellar mass gives a minimum planet mass 35% lighter than Saturn. The transit depth gives the radius ratio, which combined with the modelled star radius means TOI-197.01 has the same radius as Saturn. A Hot Saturn and a Bright Future! The result is TOI-197.01 is a hot Saturn orbiting a late subgiant/early red giant star. The combination of spectra and the large frequency separation from asteroseismology shows the star has just started ascending the red giant branch. 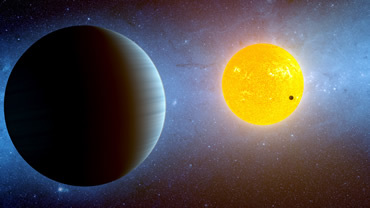 TOI-197.01 represents the starting point before gas giants reinflate due to the strong flux from their evolved stars. TOI-197.01 is significant as the first transiting planet orbiting a late subgiant/early red giant with detected oscillations measured by TESS, and only the 6th ever (with the others found by Kepler). Indeed, fewer than 15 transiting planets are known around red giant stars in total. This is an exciting result as it shows that even with 27 days of data, TESS should allow us to study the oscillations of thousands of bright stars in the 2 minute cadence data. TOI-197.01 is also one of the most precisely characterised Saturn-sized planets, with density constrained to 15%, demonstrating what we can gain when we can ‘listen’ to exoplanet host stars.